The Author, Tracey Chantel Marshall, who's also the Owner, Promoter & Talent Director of her company Access to Arising Artists Promotions, was inspired to write this book while working with Clieints. In this reference guide are basic tips for aspiring singers who would like to pursue a singing career but don’t know where to start. Speaking from first-hand experience, she will share with you some tips on how to initiate the process of taking the first steps in developing, exposing and showcasing your musical talent. The purpose of this book is to guide aspiring singers down a path that will lead them on an journey to building an enjoyable and successful music career. She will tell you how to form a solid foundation that will put you in a position to attract professional managers, record labels and to build a fan base. 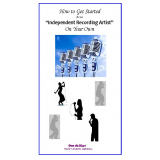 In this guide you will have obtained the resources and tools to create industry awareness and buzz for your projects which will hopefully enable you to become a successful Independent Recording Artist. If you would like to have the Author, Tracey Chantel attend your next event for a book signing, please send your requests to cepublisher@gmail.com. This is an easy to read paperback book that is a light weight carry. The pages in the book are designed for its Readers to take down notes for each tip provided where ever needed. The Author was very specific in the basic tips provided making this book one to keep for a Lifetime. As an arising Artist you will want to develop a fan base......"
Make sure you choose the right venue to perform in; here are a few tips on what to look for:......"
To continue building your music career and keeping it on track."